Love your customers and Dare to be different! and the river of revenues. 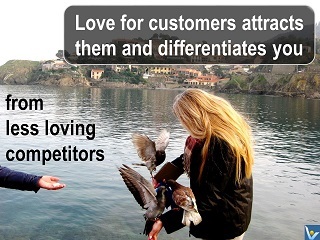 Love for customers is fundamental for inventing a great product that customers would love. If you are to give your best and prosper you need to be passionate for both your work and your consumers. What are the unsatisfied needs and desires of the consumers? How could you make them happier and keep amazing them with various features of your next product as long as they use it? Don’t wait until you have all the answers, start playing with your promising ideas, involve consumers as co-innovators, build prototypes. Create a great product vision and keep it in your mind as you create various technologies, parts and applications. Start with strategic creativity to make sure you are moving in the right direction. 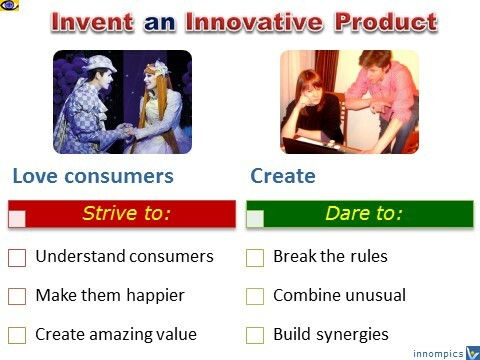 Then, start inventing the product itself: challenge assumptions, break rules, experiment with unusual combinations. A hackathon may help invent a new product and construct a working prototype within a narrow time frame.